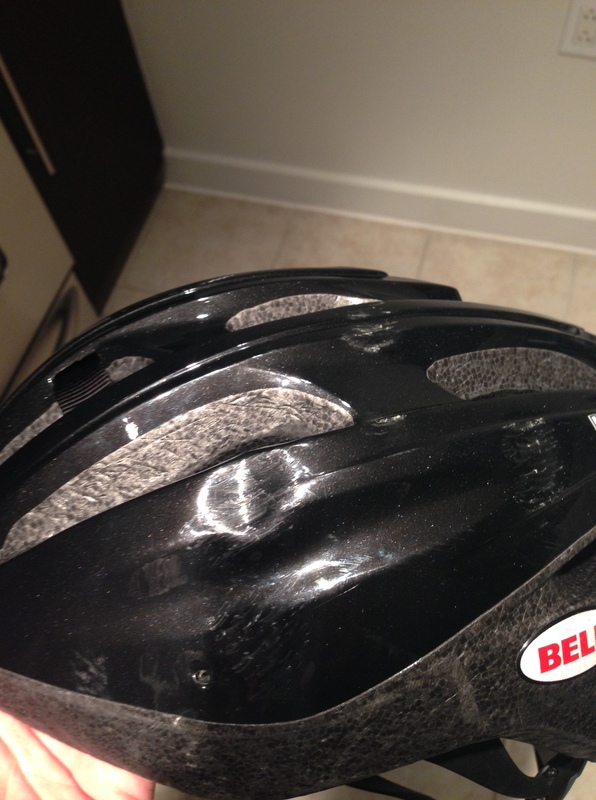 Kids and adults alike should always wear their helmets when riding a bike. Tonight, I found that out that hard way…but am thankful I was taught to always wear my helmet and has one on when my head hit a brick road and bounced repeatedly (thanks dad!). As many of my bloggers know, I love to bike! Ir’s excellent cross training and works muscles that complement running well. I bike to and from work (about 15-20 minutes each way) because I love stretching my legs and getting a good warm up in before my evening runs. In the mornings it helps wake me up and get the day going…and Lord knows I need help waking up! 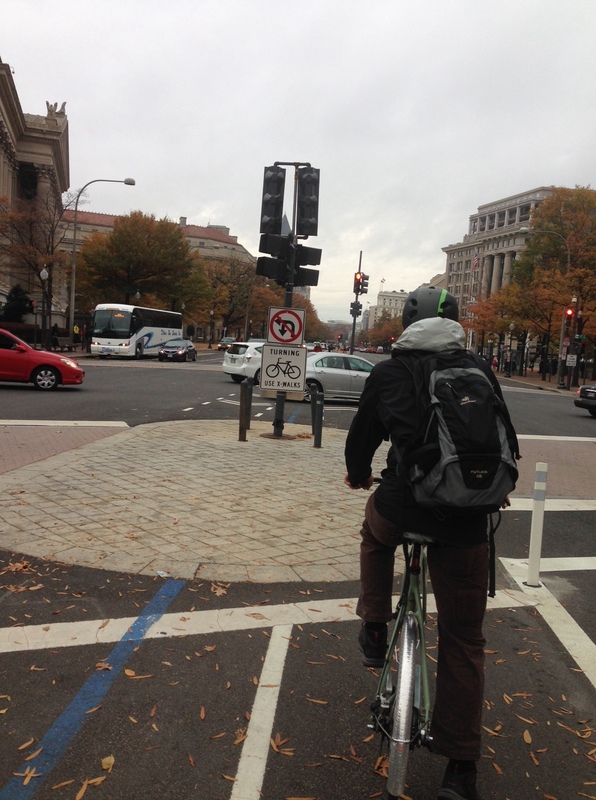 DC is a very biker friendly city and we have bike paths/lanes from our front door all the way to my office – and that’s a real blessing! It makes biking to work fun, safe, and enjoyable. I always wear my helemet, I have a reflective backpack, ankle band, and light on my bike. I also always obey signs and pedestrians. The bike lanes take me along some of our Nations treasures: the Capitol, Smithsonian Museums, the National Mall, embassies, and even the White House. I take the same path every single day and could probably do it blindfolded (but don’t challenge me). 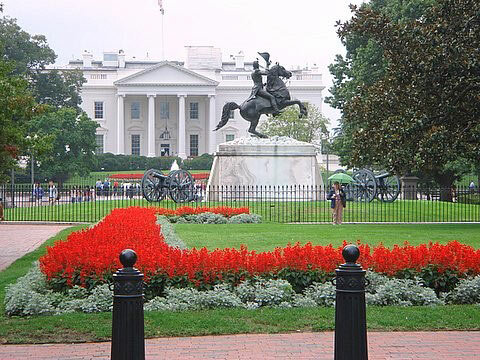 Those of you familiar with DC probably know Lafayette Park. A beautiful little park behind the White House blocked off to cars where bikes and pedestrians can crisscross in and out of NW DC. It’s essentially the back entrance to the White House and many of my commutes have been diverted by closures, the Obama’s leaving for school or dignitaries coming in for meetings. The usual. Notice those pillars and the brick? Well today the car gates were blocked off with cones so I rode onto the sidewalk instead as instructed by the Secret Service police. This happens all the time so it was not unusual. I was cruising along on the brick sidewalk heading towards a couple of posts like the ones pictured above and that’s where my memory gets fuzzy. I remember my a missing brick on the pathway and my tire hitting it which caused my handle bars to hit those lovely black posts above and send yours truly flying. I don’t remember actually hitting the post, or being airborne, or my clip-in shoes clicking out, but I sure remember hitting the ground. My left side of my body hit the ground the hardest – hip, wrist, elbow, and shoulder…and my head. Ahhhhh my head. I remember my heading bouncing on the ground multiple times and could see where from my helmet dents. It hurt like hell. I remember laying on the ground and trying to figure out what the heck just happened as a Secret Service cop shook my arm trying to get my attention. He kept asking if I was alright and then radioed for a medic. Oh crap. Medic, Secret Service, White house…I just wanted to get home and go on my evening run! The guy was right behind him in seconds with a bag and helped me up. They took off my gloves and checked out my arms, wrist and fingers. Checked my neck and head and legs. They even made me call home to make sure someone was going to be there because they were worried about being alone if I had a concision. Needless to say I was crying, embarrassed, and Maxwell was scared as hell! Before they gave me the all-clear to go, the officer told me that he ran over because he could hear my head hit the ground. He said he could hear my helmet hitting the ground and that without my helmet that the crash would have been a lot worse. I believe him. Was I going too fast? Probably. Should I have been paying more attention to the road condition? Probably. But the bruises on my hip, leg, shin, shoulder, and elbow along with the throbbing pain in my head will be solid reminders this week for me to slow down, pay more attention, and always wear my helmet…and that I will probably be taking the metro this week! So wear your helmet blogger fiends! Those dents aren’t standard and your head will thank you later! Wow! First. It’s awesome that you live in a city that is so biker friendly! I’m glad you are ok! Nothing like the secret service to give a girl a hand! Super scary – but the best of all places it could have happened because medics were RIGHT there and no cars were around. DC has really become more biker friendly throughout the years. The city is covered in bike lanes now and bike rentals are on every corner! I always wear my helmet and I think it is so dumb when people don’t. I’m so glad you’re okay! My husband has crashed and hit his helmet a couple times. Those dents are like a badge of honor because you know it could have been your head! So true! My body is in a ton of pain this morning and sleeping did not happen last night, but I keep thinking about how horrible it could have been if NOT for the helmet. Thank goodness you’re okay and wore that helmet! I’m too terrified to by in NYC, but would never do it without a helmet. Just not worth the risk. I would be too terrified to bike in NYC as well!! Wow! I’m glad you’re ok. It scares me to see people not wearing helmets. Thank goodness for yours. Thank you! It really scares me that people ride without them as well! Oh my god that’s awful! I hope you are feeling okay! You’re very lucky it happened near people who could help you. Plus this might be a cool story to tell your kids one day although I’m sure you’re upset about it now. I mean, a secret service guy took care of you? That doesn’t happen to most people! I’m just trying think positive here but seriously I hope you feel better soon! Thank you! It hurts even more today (delayed onset muscles soreness) but luckily it was a snow day and I worked from home!